OK, after some delay due to putting the microtiter plate wrong-way-around into the plate-scanning machine, I have the results of the DNA assays of my bead+DNA preps before and after a final wash. I think the diagram is pretty self-explanatory. Most important result: Almost all of of the DNA is firmly attached to the beads. 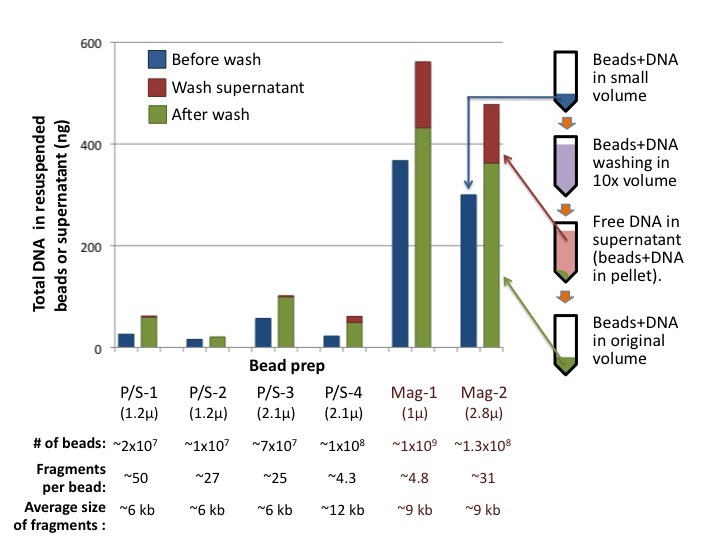 Even for the magnetic Dynabeads (columns on the right), the volume of DNA-containing supernatant remaining with the washed beads contributes no more than 1% of the total DNA in the -after-wash prep. The three preps on the right have fewer but larger fragments than the three preps on the left. 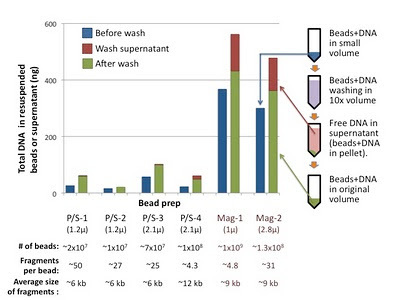 Surprisingly, the Picogreen assay detected consistently more DNA on the beads after washing than before washing. This is probably an artefact of something. The beads were all originally in TE (10 mM Tris, 1 mM EDTA), and were washed in TE overnight and resuspended in TE. Might the overnight rolling at 37 °C have better dispersed the DNA so the Picogreen could access it easier? This seems unlikely to be the explanation as, because of my putting-the plate-in-backwards error, all the samples were mixed with Picogreen and then sat for 24 hr before being read. Because the tweezers work doesn't need millions of beads, these preps should be enough to go on with. This characterization also gives me confidence that my biotin-tagging and bead-attaching procedures work reliably. 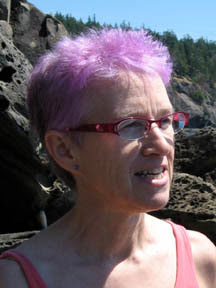 Next steps: Repeat the transformation and cell-attachment assays. But first, clarify the bead-clumping situation.